This is my last project to post, but I had to mention it. Either I’ve been spending way too much time on Pinterest (guilty) or I dreamt this idea up somewhere in the shallow pools of my mind, but I swear I came up with this first. I don’t have a before of this project because the before was so unsightly, I had to paint immediately before my eyes melted. But I bought an old hutch at my local consignment store (for $25, I might add), mainly for the bottom piece. I painted it and it is now my TV console. But I was a little stumped as to what to do with the top of the hutch. It was too convenient to not use this piece of furniture somewhere. I could set it on a desk and have it be a bookshelf; my mind was reeling with ideas. But suddenly it hit me! I knew exactly where it was supposed to go. I got out my trusty tape measure and measured whether or not it would fit. I painted it and now it is sitting in its most perfect spot. Hi Mary Jo!! Thank you for your question. I attached it with picture wall hooks at the top of each corner of the piece. The hole at the bottom was attached the piece and the hole at the top was where it was screwed into the wall (and sunk into an anchor). I hope that helps you!! Thanks! I love this idea!! I have one almost exactly like this except mine only has 2 shelves. Would you mind telling me how tall yours is so I can judge to see if mine will look as good as the one you have with 3 shelves? Hi Kim! Thank you for your question! My hutch top is approximately three and half feet tall so the whole thing on top of the tub is about six feet. I hope that helps you!! This is a great idea. Did you have to use a special paint in case it gets wet? Hi Diana! Thanks for your question. I just used semi-gloss paint and so far it has held up really well. The bottom actually has some metal feet that keep any water from getting underneath it and rotting it. So maybe that also helps. Thanks again! 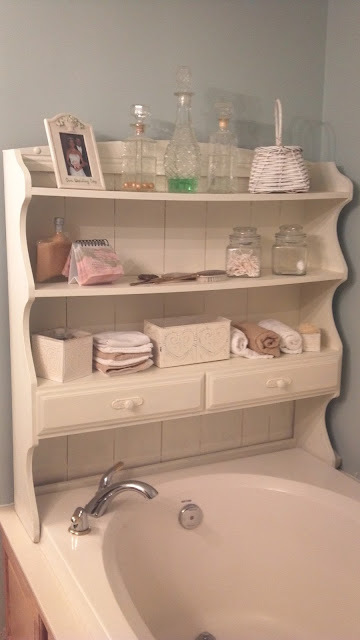 I love this idea did you make the shelf unit or did you buy it? It would go perfectly in my bathroom as I need extra storage and this would be great. Hi Tilly! I bought this piece as the top of a hutch! It fit perfectly on each side of my tub. The base I used as our TV console. Thanks for commenting! Looks like this is a tub only–not combined with a shower. What a clever and practical as well as stylish addition to your special place to get away from it all.